Spring will soon be here (no, it’s true) and it will be time to get the water sprinkler system out of winter storage and start thinking about lawn care again. Of course, there might be a leftover from Old Man Winter and it might be doing damage to your lawn. We are talking about snow mold. 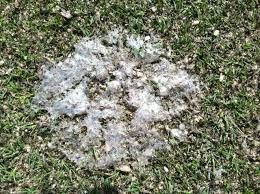 Snow mold is a fungal disease that often appears in the early spring, right around the time the snow (hopefully) melts. There are two types of snow mold, grey snow mold and pink snow mold. Don’t let the name fool you. This pink is not pleasant. Pink snow mold is the more severe of the two types of mold because it can infect the crown of the plant whereas grey snow mold only affects the leaf tissue. You don’t want any snow mold on your lawn. Snow mold tends to look like circular patches of dead and matted grass. You may also notice a white or pink color around the edges of the patch. Once you've identified snow mold on your lawn, it’s time to take action. First thing to do it try and remove any remaining snow piles on your lawn. After you've gotten rid of the snow, get out a rake and rake the patches of snow mold. Raking the snow mold patches will help loosen matted grass and help the lawn recover quicker. Be careful not to tear out all the grass. Raking will also encourage drying. Once the infected area has dried, the infection should go away and the grass will start to grow out. You can help with the healing process by applying some grass seed. Sometimes, over-seeding is necessary. If the snow mold damage is severe, adding some topdressing to the infected areas can help re-generate the growth of turf.